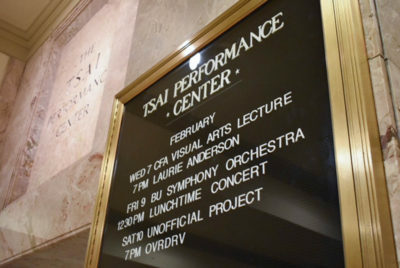 Tsai Performance Center erupted into full-fledged screaming on Wednesday during the opening of “All the Things I Lost in the Flood,” a project based on performance artist and singer Laurie Anderson’s book of the same title. Anderson had asked the audience to scream in honor of Yoko Ono’s 85th birthday to mimic a video of Ono’s reaction to the last year’s political climate. After the yelling stopped, Anderson’s talk turned into a big-picture discussion of the power of words. Anderson was NASA’s first Artist in Residence, and currently has work at the Massachusetts Museum of Contemporary Art. She is known outside of the art world for her roles in and direction of various films, as well as her presence on the United Kingdom pop charts beginning in the 1980s. She has since branched out into the writing sphere. She wrote her new book in response to Hurricane Sandy, which destroyed a large portion of her life’s work in 2012, leaving her “completely devastated.” However, Anderson said the loss revealed to her the power of technology and since then, she has incorporated technology into her projects. The live show transfers thoughts from her book into a multimedia format. It includes everything from a video of a plastic parrot talking with a computer’s voice to a virtual reality experience featuring Anderson’s narrations and detailed designs of walls made of chalkboard. Max Pizzardi, a senior in the College of Communication, said they had not yet read Anderson’s book, but has looked to her artistic approaches for inspiration throughout life. “We’re interested in hearing about how people arrive at a generative space that allows them to make the art they want,” Pizzardi said. Pizzardi said they went to the event on Wednesday partially because they are interested in how Anderson’s work is completely unique. “I like her politics and I read a lot of her interviews, so I thought this would be a good way to get more perspective from her,” they said. Sharon Sankey, a 56-year-old Roxbury resident, said she admires how Anderson uses so many different media in her work. Anderson’s creative process is familiar to David Harrington, the artistic director, founder and violinist of Kronos Quartet. Anderson recently collaborated with Kronos for the creation of “Landfall,” an album based on similar ideas found in her latest book. “I’ve always thought of Laurie as a collector. She’s like a hunter-gatherer; she gathers things that intrigue her and interest her,” Harrington said, reflecting on his experience working with Anderson. Anderson’s talent for merging many kinds of media transports fans into her own thoughts and encapsulates the boundlessness of art.